Are you feeling a bit of cabin fever? Ready for the snow and cold to give away to sunny skies and warm temperatures? You’re not alone. This is the time of year when many Minnesotans start dreaming of spring and the chance to enjoy their yards again. Fortunately, the Minneapolis Home & Garden Show is just around the corner to inspire and provide a peek at the season’s hottest new trends. Here’s a rundown of what to expect. If you’ve ever wanted to meet some of your favorite HGTV and DIY Network stars, here’s your chance. Paige Davis from “Trading Places,” Jason Cameron from DIY Network’s Desperate Landscapes and Kelli Kaufer from “Curb Appeal” will all be appearing on the main stage along with your favorite anchors from WCCO! Sponsored by the Minnesota Horticultural Society and Pond King Water Gardens, this is the place to get tips on everything from landscape maintenance to raising chickens and more. You’ll also learn how to grow your own mushrooms and take better photos of your gardens. This year the stage will be among the featured gardens on the show floor. They’re all designed to give you a look at hardscapes, waterscaping, specialty plantings and other landscaping assets that are sure to provide lots of inspiration for your projects. All of Minneapolis’ best landscaping companies, like ALD, will be on hand to demo their latest offerings and answer all your questions. You’ll also find construction and renovation companies, indoor and outdoor lighting providers, kitchen & bath, and pool and spa experts. You’ll also find the best Minnesota made products available for purchase. Be sure and stop by to get all the info you need for whatever projects you’re considering. The floral market is back again this year, displaying gorgeous floral designs using native flowers and plants. It’s set up at the entrance, so your inspiration starts the moment you walk in. You’ll find design ideas for inside and outside your home and maybe even a little magic. The show is offering “Demo Before You Reno” an interactive exhibit where you can try out a variety of new products including painting tools, smart lighting solutions, and stone panels. You’ll be able to get hands-on with them and ask representatives from the manufacturers any questions you may have. The show has plenty of inspiration for inside your home as well. The Idea Home area showcases home design and architecture, including siding, kitchen design, paint, windows and even furniture. If you are thinking about new countertops, closets or bathroom fixtures, this is the place to go to learn about a variety of options. If you’re considering a new patio, outdoor kitchen or just some new outdoor furniture, then you’ll want to visit the Backyard Lounge. Here you’ll find a variety of new design ideas you’re welcome to contemplate while sitting back and enjoying your favorite beverage. It’s a chance to take a break from all the excitement of the show. Finally, what would a home and garden show be without the chance to get some goodies for your garden? Here’s you’ll find plants, seeds, garden tools, garden décor, bird feeders and accessories and everything you’ll need for your own private garden oasis. You’ll also be able to talk to experts from the Minnesota Horticultural Society. 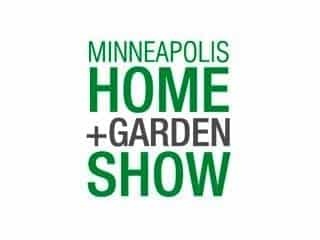 The Minneapolis Home & Garden show will provide you with inspiration and information to help you decide on the perfect landscape, hardscape and waterscape designs for your home. Don’t miss it! It happens March 30-April 1 and April 6-8 at the Minneapolis Convention Center. Tickets are available online.